Oceanfront Luxury Beachhouse! Well maintained 6BD, 6.5 BA with private heated swimming pool. Central heating and air conditioning. 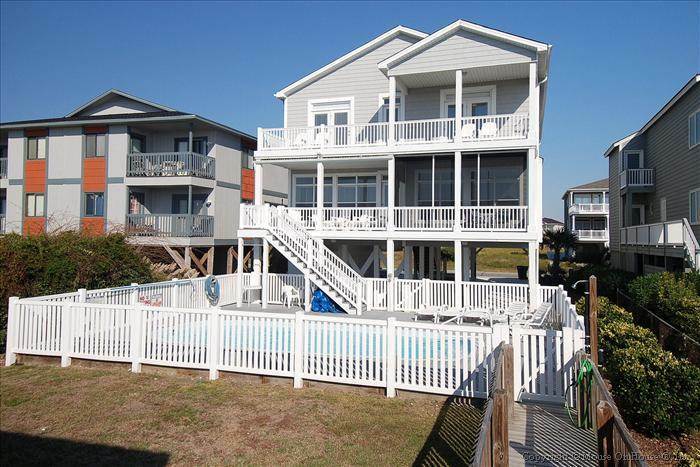 Tastefully and comfortably decorated home that has everything you may desire for your beach vacation. Seven televisions, large flat panel in the family room, 6 DVD players and 1 blu-ray player, wireless internet access, phone with domestic long distance provided, stereo with ipod dock, gas fireplace and a jacuzzi tub in master bath. Every bedroom has its own bath. Fully equipped kitchen includes an oversized refrigerator, dishwasher and microwave. Large dining table with extra seating around large kitchen island. There is a wet bar with free standing ice maker in living area plus a second full refrigerator in store room for extra drinks and other items. Washer/Dryer located off the hall. Outside there is a charcoal grill, enclosed hot/cold outside shower, sundecks and a gazebo on sand dunes to capture ocean breezes and glorious Carolina sunrises and sunsets on this south facing beach. Non smoking and no pets allowed. All bed and bath linens included. Beds are made and bath towel sets provided for 16! Pool heat is available on request October - May for an additional $75 per day. Sleeps 16. Downstrs:Queen, 2 Doubles. Upstrs- King, King with jacuzzi, 2 Bunk Sets, 2 Singles. This house is Wonderful!!! The oceanview from the greatroom, the pool, and the decor is beautiful.The porches and rocking chairs are great to relax on and chill after a day of sun and surf. All the beds were very comfortable every one enjoyed the weekend. We are going back again next year and hopefully many more years to come.